I am really trying to improve my skin care routine this year, I have a pretty good routine to be fair but I am also really into making my own and buying face masks. 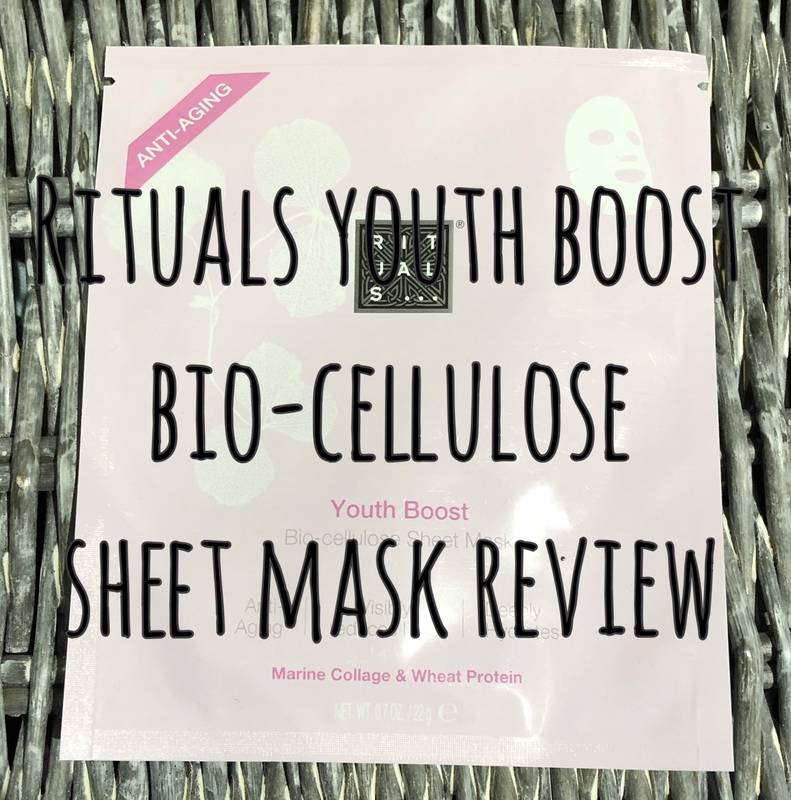 When I went to Bicester Village at the end of last year, my friend and I both picked up this sheet mask, Youth Boost. This is available in normal rituals shops, as well as online and in their outlet stores. I love Rituals products and I had to try this face mask out. I would say due to it being winter, colder and heating is on my skin is naturally drier than the summer months. I am also suffering with a rough patch which looks to be eczema. I don’t know why I have managed to develop eczema aged 28 but there we go. If you know me or have seen my youtube videos, you will see that I hardly wear makeup and my skin is normal clear and in such a good condition. I actually have never had a spot on my face. You know those ones most teenagers got/get. Never! Just have to say I am lucky with the skin I was born with. This is my first sheet mask to try. I love face masks and want to add more reviews like this to my posts. Would you be interested? 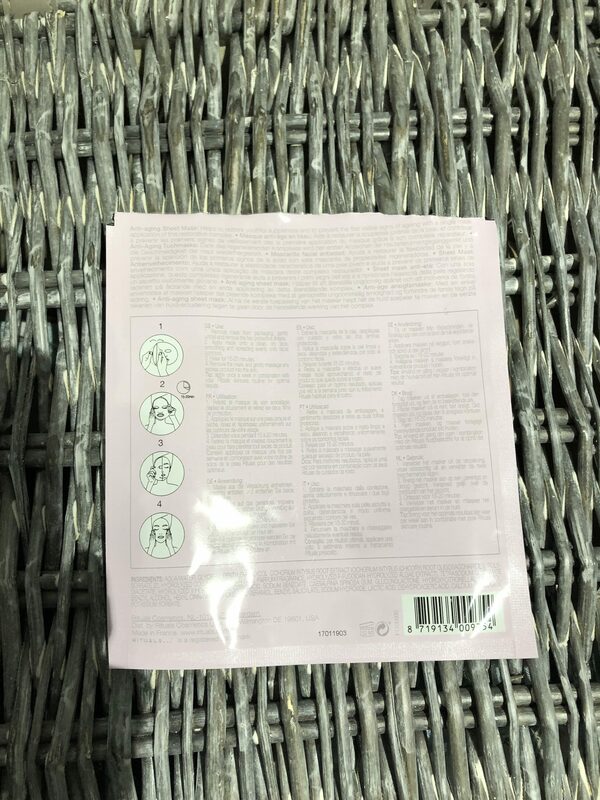 This sheet mask helps your skin because the sheet mask soaks your face with anti-ageing serum based on marine collagen which the moisture helps to improve the skin texture. It helps restore youthfulness and prevent the first signs of ageing with a single mask application. I would have to say I was a little worried at first, firstly because the sheet was massive for my little face. But also for the amount of moisture in the sheet. I thought It would drip off. 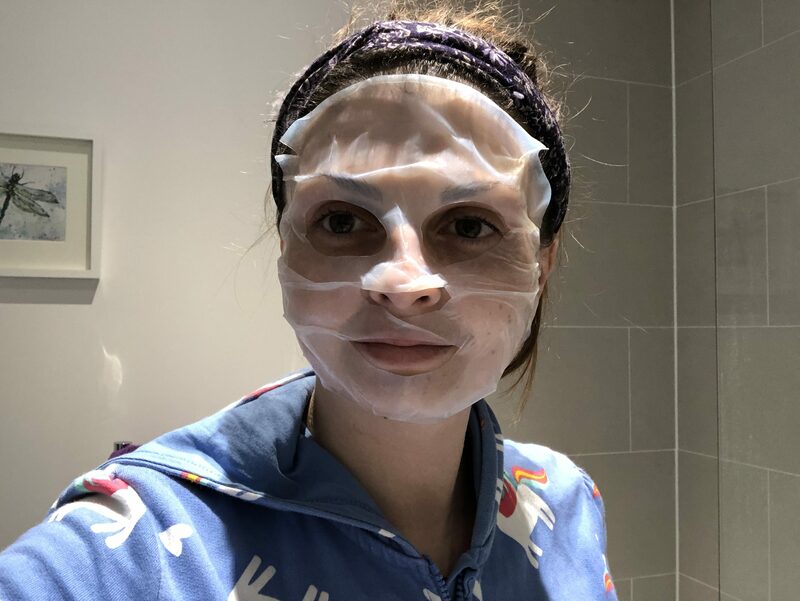 I like to do face masks when I am sitting chilling watching tv or when I am writing blog posts and editing videos. It’s a time to add in that extra self care whilst busying doing what needs to be done. I have to say this I am blogging and creating youtube content mainly because it’s what I enjoy doing. I love to film and the more I get into writing or if I am on a flow there is no stopping me. The directions were easy to follow with the step by step instructions on the back of the pack. I took of the top layer of the mask, and placed the mask onto my face. Simple as. I walked away and wrote a bit of my blog. I must admit whilst its good to improve your skin care, it’s also a time where I get carried away writing and the mask stays on for an hour or so. So if you are to multi task please set the timer for the mask. Though I guess a little longer than the 20 minutes they suggest doesn’t hurt. After the 20 ish minutes I removed the face mask. It states if you have excess moisture on your face then to rub this into your skin gently. The added mask to your week really does help your skin, if not now but later on in life. I could see a difference from using this mask and I would use this mask again. It made my skin feel deeply hydrated, soft and smooth with the boost to feel more energised. This mask is said to be great for all skin types. What face masks would you recommend I try? Or are there any you want to try that I may like to too?